LAKE BUENA VISTA, Fla.—The 2018 AAU USA International Collegiate Team accomplished many feats during season. Thousands of fans on social media around the world followed their fortunes during the campaign through Scotland and Ireland. They finished with a program best 8-3 overall record (.727), including undefeated (6-0) in their regular season games and 2-2 in tournament pool play in Ireland, enough to earn the #2 seed in the Ireland International Tournament championship game, at Ashbourne, County Meath, Ireland. It marked their second appearance in a championship game in three years, including playing as the Sant Boi Barcelona Falcons representing Spain and winning back-to-back regular season pennants in the Collegiate Baseball League Europe (CBLE) in 2016-2017. A tune-up event for the #1 seed Ireland National Team for the European Baseball Championship Qualifier and drive for the 2020 International Olympics, the title matchup was AAU USA International Collegiate’s biggest game since clashing with the La Rochelle Admirals representing France as the No. 1 and No. 2 teams in the CBLE final in the Netherlands in 2016. The collision of the two top teams in the Ireland tournament, top coaching and elite talent made the matchup one for anticipation. But they couldn’t contain Ireland in the winner-take-all showdown at beautiful Ashbourne International Baseball Centre, home of the Irish National League club Ashbourne Giants. Former college players HC Chris Cummings, director of player development Jared Fabian (director of player personnel for West Virginia University of the NCAA Division I Big 12 Conference—Baylor, Iowa State, Kansas, Kansas State, Oklahoma, Oklahoma State, TCU, Texas, Texas Tech, and West Virginia), and manager Mike Graham led AAU USA International Collegiate. Former college player Donegal Fergus (AC, University of Washington of the NCAA Division I Pac-12 Conference—Arizona, Arizona State, California, UCLA, Colorado, Oregon, Oregon State, Stanford, USC, Utah, Washington, and Washington State), former pro Nick Lockwood (MLB’s Minnesota Twins organization), and manager Sean Mitchell led the Ireland National Team. Dominant throughout Scotland and their final regular outing, an exhibition game vs Ireland, AAU USA International Collegiate’s unforgettable summer ended one victory short as Ireland won the championship game, 8-4. Two weeks earlier their season opener in Scotland on July 6 saw Daniel Keating, Isaac Lewis and Ryan Cunningham combine to throw a 25-0 shutout of the Edinburgh All-Stars at Warriston Park’s Bobby Thomson Field, home to the Edinburgh Cannons, Diamond Devils, and Giants of the Scotland National League. They followed that by entraining across Scotland to Glasgow’s Tollcross Park and beating the Glasgow Comets, 20-2, behind CJ Cummings’ four hits over five at bats. In the second game of the Saturday twinbill, Brent Jones and Keating teamed up to a throw a no-hitter in a 25-0 defeat of the Glasgow Galaxy. With the sweep of the Glasgow clubs they were gaining momentum, but were challenged the next day. 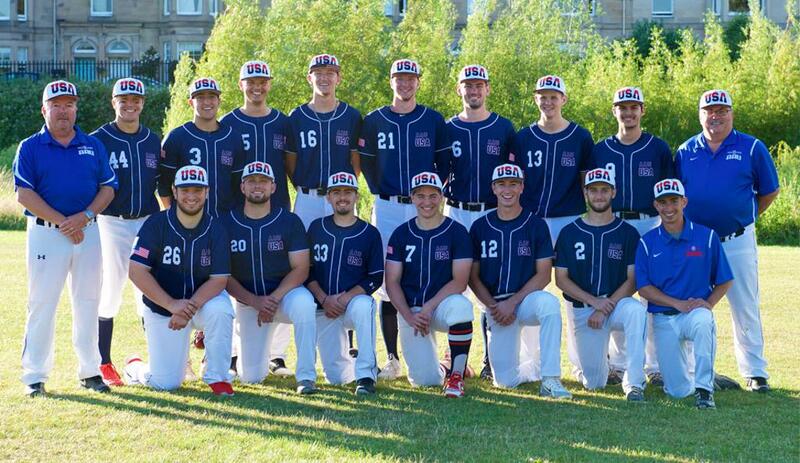 In the biggest game ever in Scotland baseball, the Scotland National Team welcomed AAU USA International Collegiate back to Edinburgh looking to make a statement. Against Scotland catcher Matt Cote’s HR and three RBIs, AAU USA International Collegiate managed to lead the Scotland National Team only 5-4 after three innings, 8-5 after four, and 12-8 after five, surviving four errors to win eventually, 15-8. That was followed by defeating the Granite City Oilers, 22-1, in the second game of the Sunday twinbill in which Connor Graham drove in seven runs. Jones was Pitcher of the Week (Rec, K, ERA), Keating runner-up. Jimmie Gentry was Player of the Week (R, RBI, OPS), Graham runner-up. Opponents selected Lewis, Cummings, Graham, and Mac McGrath USA/Scotland Series all-tournament. The Scotland campaign concluded, AAU USA International Collegiate departed for the Emerald Isle, Ireland, for Week 2 on a five-game winning streak. During that stretch, they surpassed all expectations with a 5-0 record. They wrapped up the regular season phase of the season in Ireland, playing an exhibition game vs the Ireland National Team, ranked No. 47 in the world baseball rankings. The game was tied at three with AAU USA International Collegiate batting in the top of the seventh when Cummings' RBI sac fly snagged a late lead that proved enough to defeat Ireland, 6-3. The opponents selected innings eaters student manager Zach Renner and Fabian game MVPs. In the Ireland International Tournament opener the next day, a 10-run second inning secured a 15-2 victory over the Ireland President's Nine. Keating, Lewis, and Jordan Moon each managed two hits and Drew Ventrelle stole four bases to lead AAU USA International Collegiate to its seventh victory. The Ireland National Team answered the call in the second game of the tournament opener twinbill, engineering a 9-5 win that handed the AAU USA International Collegiate Team its first 2018 loss. Gentry led AAU USA with three hits in five at bats. He set the pace the next day too collecting four hits in six at bats as AAU USA International Collegiate defeated the President's Nine, 19-8. The victory clinched a berth in the tournament championship game vs the unbeaten Ireland National Team. Before that, however, AAU USA International Collegiate and the Ireland National Team met a final time in pool play with no bearing at all on the tournament standings or the championship game ahead. Down by seven runs in the seventh, AAU USA International Collegiate fought back but fell short in a 10-8 loss. Cunningham, Graham, and Ventrelle all collected multiple hits. In the Sunday championship game July 15, AAU USA International Collegiate fell behind early and couldn't come back in an 8-4 loss. Cunningham, Graham, and Ventrelle again had multiple hits. Schipsi was Pitcher of the Week (Rec, K, ERA), Keating runner-up. Lewis was Player of the Week (R, RBI, OPS), Gentry runner-up. Opponents selected Lewis, Cunningham, Jones, Gentry, Ventrelle, Schipsi, and James Sofield all-tournament. In the course of the two-week campaign, AAU USA International Collegiate obliterated numerous team records. They had six returning players (46%): C Cummings (University of Mary Washington, Va.), SS Gentry (Albright College, Pa.), OF Graham (Central Penn College, Pa.), P Keating (Wellington HS, Fla.), Lewis (St. Lawrence University, NY), and OF/U McGrath (Shenandoah University, Va.). They received international career best output from all, as well as all the roster’s new faces who formed a potent force, including Conor Cochran, Moon, and Ventrelle. AAU USA International Collegiate relied heavily (83%) on six arms to lead the pitching. Keating led the way along with NCAA Division I righties New Jersey Tech’s Sofield and Jones; LHPs Schipsi of NCAA Division III Cabrini University (Pa.) and Lewis; and rising college freshman RHP Cunningham (Middlesex CC, NJ, commit). In the rotation and bullpen, Keating (2-0, 3.08 ERA), Lewis (1-0, 3.27), Sofield (0-1, 3.73), Jones (1-1, 5.78), Cunningham (1-0, 4.50), and Schipsi (2-0, 6.58) averaged 10.2 innings pitched. Keating’s wins/ERA mark is good for the 6th-best in team single-season history, and earned Top Gun/Pitcher of the Year honors. Lewis was the anchor in the middle of the lineup all season as he hit .460 with 16 RBI. With Gentry he led the team in hits (23) and was 1st in stolen bases (9) and 2nd in XBH (5, tied) and OPS (1.089). Coupled with his contributions on the mound as a key reliever and in the field (1.000 FPCT, 1.97 DRF), all of this earned Lewis the Player of the Year honors. Gentry, who was named the team’s Offensive MVP, had a very productive season, hitting .434 with an OBP of .475 at the top of the lineup. He tied for first on the team in home runs (1), was 1st in OPS (1.097) and XBH (8), 2nd in runs scored (23), and led the team in doubles (7). The 23 total hits are good tied for most in team single season history, and his 40 runs produced are 2nd-most in team single season history. Cummings was named Defensive MVP. He excelled in numerous roles in the field. His 1.000 FPCT and 6.45 DRF overall is the 4th-best in team single-season history. He also hit .364 with a .500 OBP at the plate this year, and drove in the 2nd-most RBIs (19) in a single season.